The National Hurricane Center is today [August 27] monitoring an area of low pressure centered about 130 miles southwest of Bermuda which is producing winds of around 35 mph. The Bermuda Weather Service said, “A low pressure center to our southwest is now being monitored by NHC for possible development into a tropical cyclone. The National Hurricane Center said, “An area of low pressure centered about 130 miles southwest of Bermuda is producing winds of around 35 mph. “While shower and thunderstorm activity has increased a little near the center during the past few hours, any significant development of this system is likely to be slow to occur due the proximity of dry air. 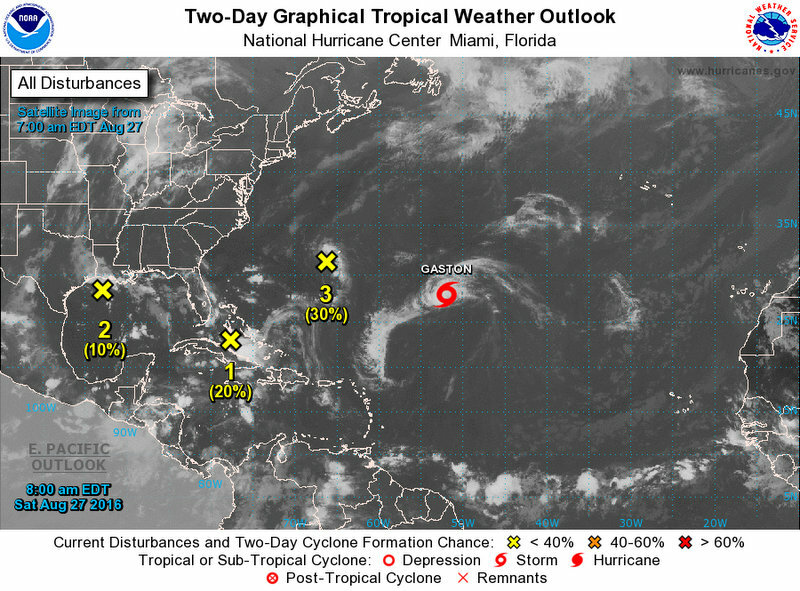 The Bermuda Weather Service states that Tropical Storm Gaston — the seventh named storm of the 2016 Atlantic hurricane season — is not a threat to Bermuda at this time. The closest point of approach to Bermuda within 72 hrs [3 days] is forecast to be 413 nm to the E, at 3.00am on Monday, August 29.